Sophie’s Squash | What is ML Reading? 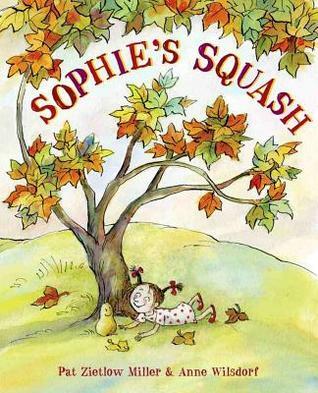 Sophie’s Squash by Pat Zietlow Miller and Anne Wilsdorf is adorable. Sophie and her parents visit the Farmer’s Market. Her parents let her pick out a vegetable. To me, it looks like she chooses a butternut squash. One of my favorite fall veggies. Not ML’s; too much like a sweet potato. But to Sophie it is not a vegetable to be eaten. It’s a new friend she names Bernice. By far the sweetest book of the year. I didn’t tell much about the story because I want you to discover the delight just as much as ML and I did. It’s a great family read-aloud. This entry was posted in Picture Book and tagged Anne Wilsdorf, Pat Zietlow Miller, Sophie's Squash by mlreads. Bookmark the permalink. Thanks! I will definitely check this one out!